It was a wild idea to cinematize a cartoon about a gorilla playing baseball in the first place. Only one of Hollywood’s major studio with full 3d technology could have handled it. KIM Yong-hwa, the director of Take Off, was brave enough to take on such a tough challenge. KIM Yong-hwa spent KRW 3 billion (USD 2.67 million) from his private property to found ‘Dexter Digital’, a VFX studio. It was 4 years ago when the planning started. 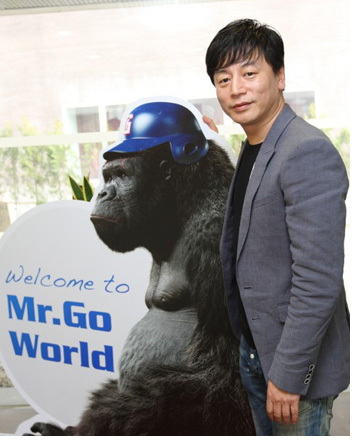 With the budget set at KRW 22.5 billion (USD 20 million), he had to make a 3D digital film with a gorilla moving and acting like a living thing. Of the total budget, KRW 12 billion (USD 10.7 million) was for VFX (not to mention it was originally KRW 8.7 billion/USD 7.8 million). In the beginning, he went to ILM (Industrial Light & Magic), one of Hollywood’s major VFX studios. People said it was a reckless idea to make such a film in Korea, where the film market is small. Some even said it would cost at least USD 100 million. Had he given up there, Mr. Go would never have been born. KIM and JUNH Sung-jin, the executive supervisor of VFX, had to start from scratch. They had no other choice because there was no related technology available at all in Korea. To make Mr. Go, he needed technologies to make every single strand of hair sway naturally, to synthesize actual footage with computer graphics, and to realize all the detailed work in 3D, all of which were rather common in Hollywood, but none of these technologies were available in Korea. So he invited VFX technicians from Hollywood to have them give a lecture. Of course he had no possibilities to purchase any technology or software, but he wanted to find a direction at least. He used the motion capture method, where he attached dozens of sensors to an actor and covered the gorilla graphics on him later, to create ‘Ling Ling’ of Mr. Go, like ‘Gollum’ of The Lord of the Rings or ‘Caesar’ of Rise of the Planet of the Apes. To make 900 shots of the gorilla ‘Ling Ling’ with VFX, it would cost USD 100 million if in Hollywood. It is known that Life of Pi directed by Ang LEE has 150 shots of the tiger ‘Richard Parker’ and it cost KRW 60 billion (USD 53.6 million) for VFX. When he inquired with Weta Digital, the VFX company that made The Lord of the Rings, Avatar and Rise of the Planet of the Apes, about the estimated cost, they said it would be at least KRW 50 billion (USD 44.7 million). KIM didn’t have enough money. He decided to make his company’s own technology instead. That’s when the software named ‘Zelos System’ was made. He completed a pipeline (the entire flow of VFX work) to make room for 3D VFX to cover actual footage (Matchmove), give shape to the gorilla character (Modeling), coloring and texturizing gorilla’s hair (Texture), express motions of gorilla (Animation), adjust the illumination of 3D data (Lighting), convert the 3D character to a 2D image (Rendering), synthesize actual footage with CG work (Compositing) and edit the whole process. KIM said, “These days, when Hollywood experts have a chance to see what we have, they are shocked and ask me how it was possible to make and manage a pipeline exactly the same way as how they do it in Hollywood with such a small amount of money.” He then added, “They even want to ask to help with VFX for their films coming after July.” A large VFX studio in Hollywood has around 2,000 workers. The cost of work at KIM’s studio is eight times lower then the big studios in Hollywood. KIM has the goal to make the film look natural so that audiences won’t realize VFX were used. He is determined to come up with a technology that will make viewers enjoy the whole film smoothly and naturally. He believes that the least visible VFX are the greatest. Mr. Go is expected to become a drama with perfectly blended VFX. KIM also thought he needed his own studio to realize his dream to make such a film. On the other hand, the studio would need a constant and stable flow of work to be maintained. He clearly knew that it would be very difficult to secure a uniform flow of work to keep the studio running. He said, “Doing only what I can handle well and leading a stable life were not all to me. I guess Peter JACKSON and James CAMERON would have thought the same thing.” KIM constantly works on Mr. Go regarding everyday as the last day. Another thing KIM is confident about is drama. He said, “I can proudly show Mr. Go to anyone. Nobody dies or cries in the film, but it will touch audiences’ emotions.” Lately, some people in the hierarchy of Huayi Brothers, one of China’s three biggest investment and distribution companies, visited Dexter Digital and watched the film without Ling Ling. KIM said they started crying from the middle of the film. This tells that the film is reliable not only for technologies but also for the story. The episode about how he attracted investment from China is interesting, too. The president of Huayi Brothers invited him one day and asked if he knew there were a number of fans of 200 Pounds Beauty in China and said he would make sure to work with him some day. Three years later, KIM went back to Huayi Brothers after finishing Take Off. He intended to cut down the budget unless he persuaded the Chinese company. Fortunately, things went well. Mr. Go will be released at over 5,000 theaters in China as well as in Korea in July. It will also screen in Hong Kong, Macao and Taiwan. In the past, the score of a Korean film in China was irrelevant to the maker. While Hollywood people shared profits with Chinese companies, Koreans had simply sold copyrights. Mr. Go on the other hand, was made in collaboration with the Chinese company Huayi Brothers. They invested USD 5 million in the film. It is an exceptional case that a Chinese company invested such a big amount of money in a collaborated film. The leading actress of Mr. Go is also XU Jiao, who appeared in CJ7: The Cartoon, produced by Stephen CHOW, a global star from Hong Kong. KIM said, “The real globalization must be based on the Chinese market. Once you have a success in China, then you can go to the States afterwards.” As a matter of fact, a company has been secretly in touch with Showbox/Mediaplex to discuss production and release of a sequel of Mr. Go in the States. KIM recalled it and said, “I wanted to make a typical Hollywood story on our own.” KIM dreams to be the Korean Spielberg and at the same time, to make Dexter Digital the Asian ILM. As KIM said, “This film will give big laughs to audiences and make them empathize and cry."